Bredillet, Christophe N.: Learning and acting in project situations through a meta-method (MAP) a case study – Contextual and situational approach for project management governance in management education; in: International Journal of Project Management, Vol. 26 (2008), No. 3, pp. 238-250. 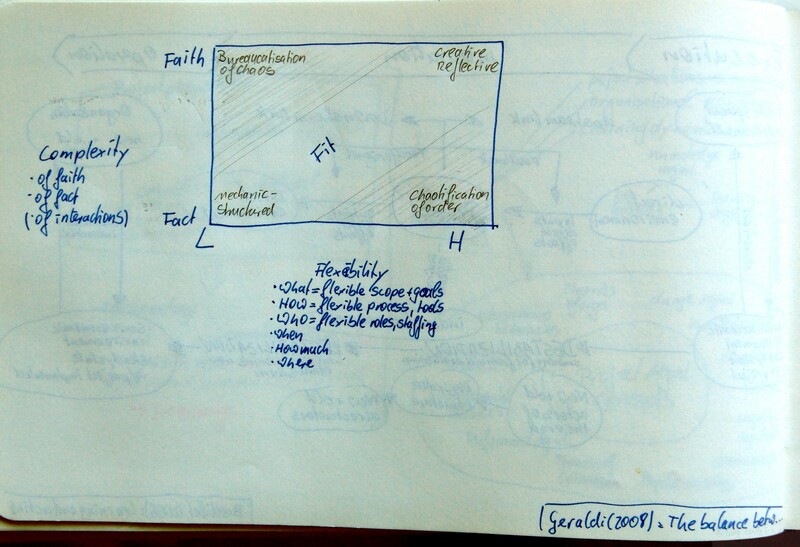 In this article Bredillet outlines his meta-method used to teach project management. This method’s goal is to provide a framework in terms of processes and structure for learning in situ, namely on projects, programmes and alike. Bredillet argues that this method is best in accounting for complex, uncertain and ambiguous environments. The authors starts with reviewing the three dominant project perspectives. a) Instrumental Perspective, which defines a project as a temporary endeavour to create something. b) Cognitive Perspective, which defines projects as exploitation of constraints and human/monetary capital in order to achieve an outcome. c) Political Perspective, which define projects as spatial actions which are temporarily limited, thus interacting with their environment. Bredillet argues that project management education does not reflect these perspectives according to their importance in the real world. Bredillet argues that project management, knowledge creation and production (epistemology) have to integrate classical scientific aspects (Positivism) as well as fuzzy symbolisms (Constructivism). He says: „that the ‚demiurgic‘ characteristic of project management involves seeing this field as an open space, without ‚having‘ (Have) but rather with a raison d’être (Be), because of the construction of Real by the projects“ (p. 240). Without any prior indulgence into epistemology (‚What is knowledge?‘ E. v. Glaserfeldt, Simon, Le Moigne etc.) this sentence is rather cryptic. What Bredillet wants to achieve is to unify the Positivist and Constructivist epistemology. Positivist epistemology can shortly be summarised to be our approach to understand the world quantitatively (= have = materialism, with only few degrees of freedom, e.g., best practices, OR, statistical methods). On the other hand Constructivist epistemology tries to understand the world with a qualitative focus (=be = immateriality, with many degrees of freedom, e.g., learning, knowledge management, change management). Bredillet summarises the constructivist epistemology citing Comte as „from Science comes Prevision, from Prevision comes Action“, and the positivist epistemology according to Le Moigne’s two hypothesis of reference – phenomenological („an existing and knowledgeable reality may be constructed by its observers who are then its constructors“) and teleological („knowledge is what gets us somewhere and that knowledge is constructed with an aim“). Bredillet then argues that most research follows the positivist approach, valuing explicit over tacit knowledge, individual knowledge over team/organisational knowledge. To practically span the gap between Constructivism and Positivism Bredillet suggests to acknowledge tacit, explicit, team and individual knowledge as „distinct forms  inseparable and mutually enabling“ (p. 240). How to unify Constructivsm and Postivitsm in Learning of Project Management? Aims at generating a convention (rules of decision) to cope with the uncertainty and complexity in projects. Ad (2): I don’t know whether n-Learning in this context stands for nano-Learning (constantly feeding mini chunks of learning on the job) or networked learning (network over the internet to learn from each other – blogs, wikis, mail etc.). Neither could I find a proper definition of S-Learning. Generally it seem to stand for supervised learning. Which can take place most commonly when training Neural Networks, and sometimes on the job. Sorry – later on in the article Bredillet clarifies the lingo: N-Learning = Neoclassical Learning = Knowledge is cumulative; and S-Learning = Schumpeterian Learning = creative gales of destruction. Ad (3): Convention Theory (as explained in this paper) debunks the notion that price is the best coordination mechanism in the economy. It states that there are collective coordination mechanisms and not only bilateral contracts, whose contingencies can be foreseen and written down. Furthermore Convention Theory assumes Substantive Rationality of actors, radical uncertainty (no one knows the probability of future events), reflexive reasoning (‚I know that you know, that I know‘). Thus Convention Theory assumes Procedural Rationality of actors – actors judge by rational decision processes & rules and not by rational outcome of decisions. Thus learning in this complex, dynamic ecosystem with its different foci of learning should have three goals – (1) individual learning, e.g., acquire Prince 2/PMP methodology; (2) Team learning, e.g., acquire team conventions; and (3) organisational learning, e.g., acquire new competitive position. In praxis the learning takes part in form of simulations, where real life complex situations have to be solved using the various concepts, methods, tools, and techniques (quantitative and psycho-sociological) which are included in the MAP-method. To close the reflective learning loop at the end two meta-reports have to be written – use of methods and team work, and how learning is transferred to the workplace. 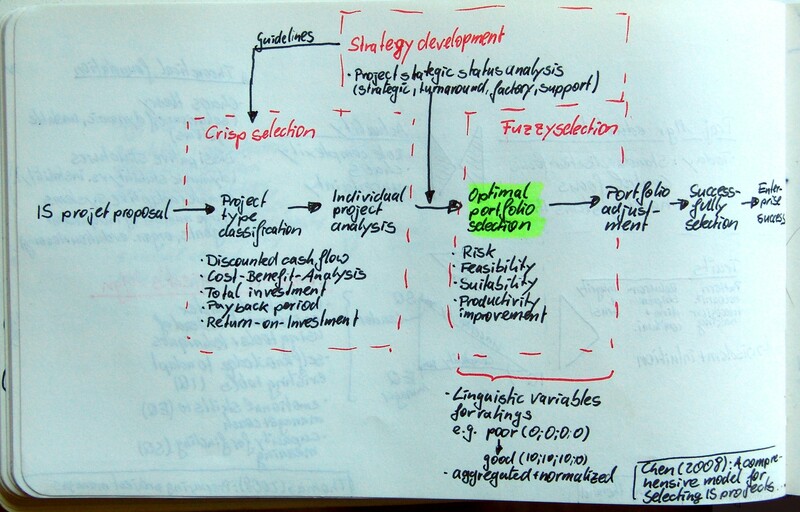 Bredillet says that with this method his students developed case studies, scenario analysis, corporate strategy evaluation, and tools for strategic control. Geraldi, Joana G.: The balance between order and chaos in multi-project firms – A conceptual model; in: International Journal of Project Management, Vol. 26 (2008), No. 4, pp. 348-356. In the sciences in general, the phrase has come to refer to a metaphor that some physical, biological, economic and social systems operate in a region between order and either complete randomness or chaos, where the complexity is maximal. The generality and significance of the idea, however, has since been called into question by Melanie Mitchell and others. The phrase has also been borrowed by the business community and is sometimes used inappropriately and in contexts that are far from the original scope of the meaning of the term. Taxén, Lars; Lilliesköld, Joakim: Images as action instruments in complex projects; in: International Journal of Project Management, Vol. 26 (2008), No. 5, pp. 527-536. Images are quite powerful. I hate motivational posters which a distant corporate HQ decorates every meeting room with, but I once saw the department strategy visualised by these folks, they include all employees and the group dynamic is unbelievable. Later on they cleaned the images, blew them up, and posted them around the company – of course, meaningless for an outsider but a powerful reminder for everyone who took part. Taxén & Lilliesköld analyse the images typically used in project management. They find that these common images, such as PERT/CPM, Gantt charts, or WBS are increasingly difficult to use in complex projects, in this case the authors look into a large-scale IT project. 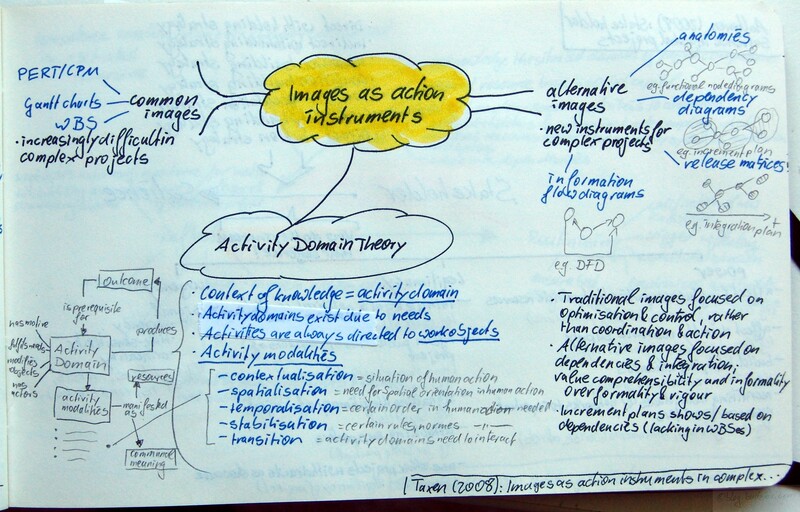 Useful images, the authors argue, need to fulfil these needs while being situated in the context of the activity. Traditional images focus on optimisation and control, rather than on coordination and action. Thus alternate images need to focus on dependencies and integration; on value comprehensibility and informality over formality and rigour. Collyer, Simon: Project management approaches for dynamic environments; in: International Journal of Project Management, in press (2008).http://dx.doi.org/10.1016/j.ijproman.2008.04.004Update this article has been published in: International Journal of Project Management, Vol. 27 (2009), No. 4, pp. 355-364. There it is again: Complexity, this time under the name of Dynamic Project Environments. I admit that link is a bit of a stretch. Complexity has been described as situations, where inputs generate surprising outputs. Collyer on the other hand focuses special project management strategies to succeed in changing environments. The author’s example is the IT project, which inherently bears a very special dynamic.He discusses eight different approaches to cope with dynamics. (1) Environment manipulation, which is the attempt to transform a dynamic environment into a static environment. Examples commonly employed are design freezes, extending a systems life time, and leapfrogging or delaying new technology deployment. (2) Planning for dynamic environments. 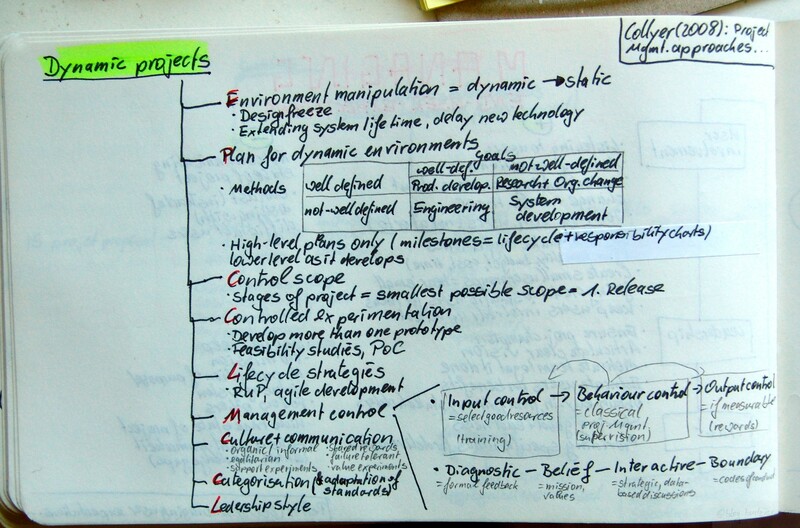 Collyer draws a framework where he classifies projects on two dimensions. Firstly, if their methods are well defined or not, and secondly if the goals are well defined or not. For example he classifies the System Development project as ill-defined and ill-defined. This is a point you could argue about, because some people claim that IT projects usually have well-defined methodologies, but lack clear goals. Collyer suggest scaling down planning. Plan milestones according to project lifecycle stages, and detail when you get there. He recommends spending more time on RACI-matrices than on detailed plans. (3) Control scope, which is quite the obivious thing to try to achieve – Collyer recommends to always cut the project stages along the scope and make the smallest possible scope the first release. (4) Controlled experimentation. The author suggest that experimentation supports sense-making in a dynamic environment. Typical examples for experimentation are prototyping (Collyer recommends to always develop more than one prototype), feasibility studies, and proofs of concept. (5) Lifecycle strategies, although bearing similarities to the scope control approaches he proposes this strategy deals with applying RuP and agile development methods, to accelerate the adaptability of the project in changing environments. (6) Managment control, as discussed earlier in this post every project uses a mix of different control techniques. Collyer suggest deviating from the classical project management approach of controlling behaviour by supervision, in favour for using more input control, for example training to ensure only the best resources are selected. Besides input control Collyer recommend on focussing on output control as well, making output measurable and rewarding performance.Collyer also discusses a second control framework, which distinguishes control by the abstract management principle. Such as diagnostic control (=formal feedback), control of beliefs (=mission, values), control of interactions (=having strategic, data-based discussions), and boundary control (=defining codes of conduct).Lastly the author discusses two more approaches to succeeding with dynamic environments which are (7) Categorisation and adaptation of standards and (8) Leadership style. Söderholm, Anders: Project management of unexpected events; in: International Journal of Project Management, Vol. 26 (2007), No. 1, pp. 80-86. Söderholm qualitatively studies in four cases how unexpected events are dealt with on projects. The author finds three most common root causes for unexpected events, re-openings of topics (mostly due to outside pressure, e.g., new definitions, new issues, politics), revisions of plans, and fine tuning of the project. Furthermore Söderholm identifies four different tactics to manage unexpected events. (1) innovative action, (2) applying detachment strategies, (3) setting up intensive meeting schedules, and (4) negotiating project conditions. Perminova, Olga; Gustafsson, Magnus; Wikström, Kim: Defining uncertainty in projects  a new perspective; in: International Journal of Project Management, Vol. 26 (2008), No. 1, pp. 73-79. Perminova et al. argue that traditional project risk management focuses on risk and that the notion of uncertainties is generealy overlooked. In their literature review the authors show the difference between risk and uncertainties in 6 selected areas of research – Economics, Psychology, Philosophy, Organisational Theory, Dictionary, Project Management. Finally they establish a working definition for project managers: „[uncertainty occurs] when existing factors/assumptions are questioned and therefore the basis for calculating risks is questionable“. Perminova et al. argue that essential for managing uncertainty are reflective learning and sense-making, since they enable flexibility and rapidness in decision-making especially since they do not restrict the choice of alternative actions in response to the situation.